Grand Central Publishing, 9781455502387, 304pp. When most of us think of Charles Lindbergh, we picture a dashing twenty-five-year-old aviator stepping out of the Spirit of St. Louis after completing his solo flight across the Atlantic. What we don't see is the awkward high school student, who preferred ogling new gadgets at the hardware store to watching girls walk by in their summer dresses. Sure, Lindbergh's unique mindset invented the pre-flight checklist, but his obsession with order also led him to demand that his wife and three German mistresses account for all their household expenditures in detailed ledgers. Lucky Lindy is just one of several American icons whom Joshua Kendall puts on the psychologist's couch in AMERICA'S OBSESSIVES. In this fascinating look at the arc of American history through the lens of compulsive behavior, he shows how some of our nation's greatest achievements-from the Declaration of Independence to the invention of the iPhone-have roots in the disappointments and frustrations of early childhood. Starting with the obsessive natures of some of Silicon Valley's titans, including Steve Jobs, Kendall moves on to profile seven iconic figures, such as founding father Thomas Jefferson, licentious librarian Melvil Dewey, condiment kingpin H. J. Heinz, slugger Ted Williams, and Estee Lauder. This last personality was so obsessed with touching other women's faces that she transformed her compulsion into a multibillion-dollar cosmetics corporation. Entertaining and instructive, Kendall offers up a few scoops along the way: Little do most Americans know that Charles Lindbergh, under the alias Clark Kent, sired seven children with his three German "wives." As Lindbergh's daughter Reeve told Kendall, "Now I know why he was gone so much. I also understand why he was delighted when I was learning German." Joshua C. Kendall is the author of The Man Who Made Lists, about the creation of Roget's Thesaurus, and The Forgotten Founding Father, a biography of Noah Webster, the lexicographer responsible for Webster's Dictionary. He is also an award-winning journalist, with work in the Wall Street Journal, Los Angeles Times, New York Times, Psychology Today, and BusinessWeek, among other publications. He is an Associate Fellow of Yale's Trumbull College. We all learn that a few virtues-ingenuity, vision, focus, hard work, tenacity-are key to individual success. Joshua Kendall slightly but fascinatingly shifts our understanding of those motherhood-and-apple-pie virtues to tell a chillier story of American exceptionalism: in the country that privileges individual achievement above all, the most exceptional people are apt to be persnickety, monomaniacal freaks, driven by (and perhaps doomed to) an abiding loneliness in their pursuits of perfection. Turns out it's hard to be an American hero. Joshua Kendall ranks with John Aubrey (Brief Lives), John Gunther (Procession), and Winston Churchill (Great Contemporaries) in his ability to render lives in exquisite miniature. His special gift, however, is locating the vein of obsession in his cast of famous men and women that drives, inspires, or perverts them. Passion in life? Yes. But as Kendall acutely demonstrates, passions that led to greatness sometimes arise from the dark worlds of near-madness, too. Sit back and enjoy! Kendall's pages all but turn themselves. 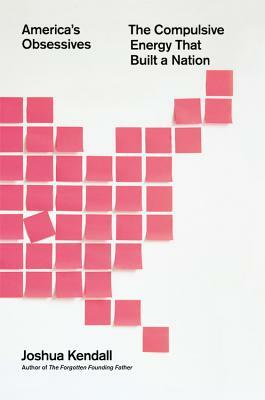 AMERICA'S OBSESSIVES is an insouciant romp through the hidden lives of a fascinating group of iconic Americans. Kendall's prose is witty; his points are sharp; and though he discusses familiar figures (including Thomas Jefferson, Alfred C. Kinsey, Charles Lindbergh, and Ted Williams), his insights will surprise you. Can private demons produce the manic energy and compulsive drive often found in men and women who achieve greatness? Kendall makes the case with gusto. His portraits will stick with you. "AMERICA'S OBSESSIVES is-forgive me-compulsively readable. Joshua Kendall takes the reader on an eye-opening and, at times, hair-raising tour through the personalities of heroic, reckless, crude, half-mad, and supremely accomplished people. Ranging from Thomas Jefferson to Estée Lauder, this diverse tribe of American icons shared a common trait-they were all, as one of them said, "born with a disposition to run things whenever [they] could get a chance." "Joshua Kendall convincingly and entertainingly reveals another important side to the psychology of the world's movers and shakers: obsession. Some of our greatest leaders and innovators are driven by an internal anxiety in a way that benefits their creativity, and that helps the world. This is another blow against that stigma against mental abnormality, which is the last great prejudice of humankind." A compelling look at how personality disorders can rule and ruin a life, and how those who come to terms with their constraints can achieve great things. Readers will delight in the weirdness that the author has unearthed. "Kendall keeps the pages flying with graceful prose rich in intriguing details drawn from his extensive research." "Kendall's book covers a range of American thinkers and achievers... and meticulously pulls out the threads in each of their personalities that evidence an undeniable interweaving of the obsessive and the brilliant." "His profiles reveal the startling secrets behind these iconic figures' extraordinary accomplishments while explaining their unique quirks and paradoxical idiosyncrasies."